ARCPANEL Roof Systems – The all in one insulated roof system with the ultimate design flexibility to create a look and feel just for you and your home. Australian made with product warranty up to 25 years for peace of mind. Contact our experienced customer support team today to discuss your project requirements or to arrange a site visit. Call 1300 200 004 or contact us. ARCPANEL roof systems are available in a range of panel types and configurations including straight, curved and multicurved panels. ARCPANEL roof systems are manufactured from genuine BlueScope Colorbond steel and benefit from product warranty up to 25 years for peace of mind. 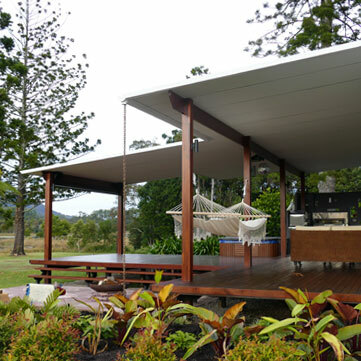 ARCPANEL roof systems are ideal for creating your own coastal vista, enviable outdoor room or entertaining area. ARCPANEL roof systems offer concealment of electrical services for a clean ceiling finish. 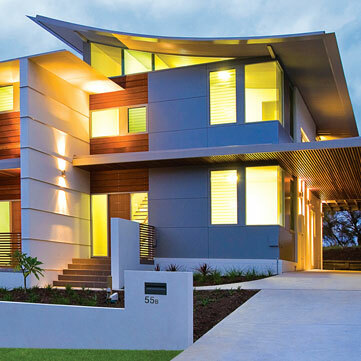 Choose from over 20 different Genuine BlueScope Colorbond colours. ARCPANEL roof systems benefit from high structural strength and can achieve spans up to 12.5m and cantilever overhangs up to 4.5m. Create architectural features, simplicity and environmental benefits all in one easy to install versatile roof system. Straight panels can be manufactured up to 21 metres in length. Longer lengths can be achieved, contact us for further details. Curved panels are custom manufactured to suit your design requirements (minimum radii 2.5 metres). Multi-curved panels are custom manufactured to suit your design requirements (minimum radii 2.5 metres). Bull-nose panels can be manufactured to suit a bull-nose radii of 600mm, 750mm and 900mm. Bull-nose panels can be manufactured in lengths up to 21 metres. What is a ARCPANEL Roof? 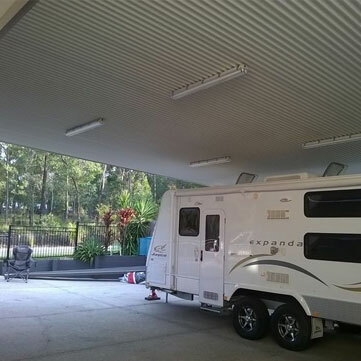 An ARCPANEL roof panel consists of a top sheet and bottom sheet of Colorbond® steel bonded to an insulated core. ARCPANEL Roof Systems are fully certified and engineered systems. ARCPANEL’s Custom and Ecotek Roof Systems are CodeMark certified. Certification provides you with peace of mind that your roof system is Building Code compliant when choosing a ARCPANEL roof for your project. The Australian Building Codes Board (ABCB) confirms that the CodeMark mark of conformity is evidence that a product, subject to the CodeMark rules, has been accredited by a CodeMark certification body as compliant with the BCA when used for the purpose as set out in the Certification of Conformity. Click here to download our Residential Roof Brochure.